Optional: Pictues of camoflauged animals, a video link to animals walking or stalking. Students will be able to practise moving mindfully. 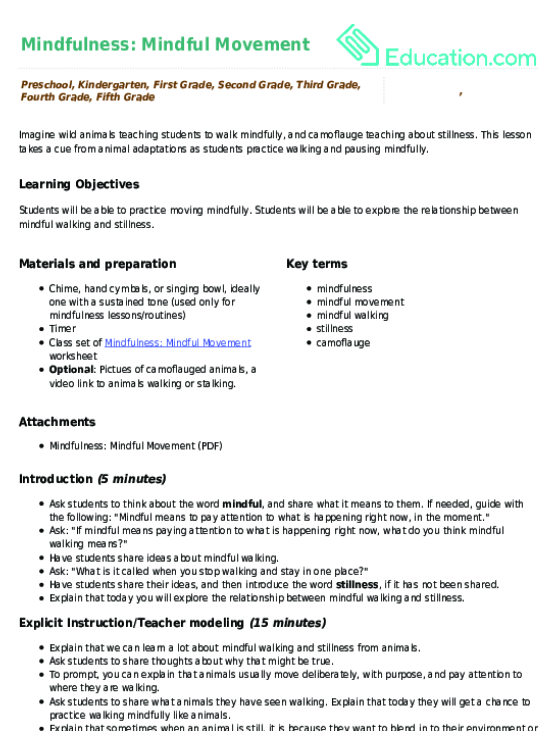 Students will be able to explore the relationship between mindful walking and stillness. 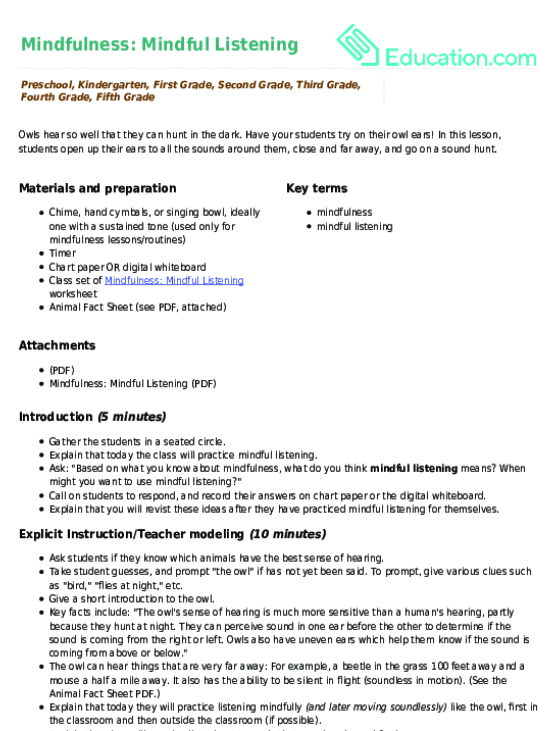 Ask students to think about the word Mindful, and share what it means to them. If needed, guide with the following: "Mindful means to pay attention to what is happening right now, in the moment." Ask: "If mindful means paying attention to what is happening right now, what do you think mindful walking means?" Have students share ideas about mindful walking. Ask: "What is it called when you stop walking and stay in one place?" 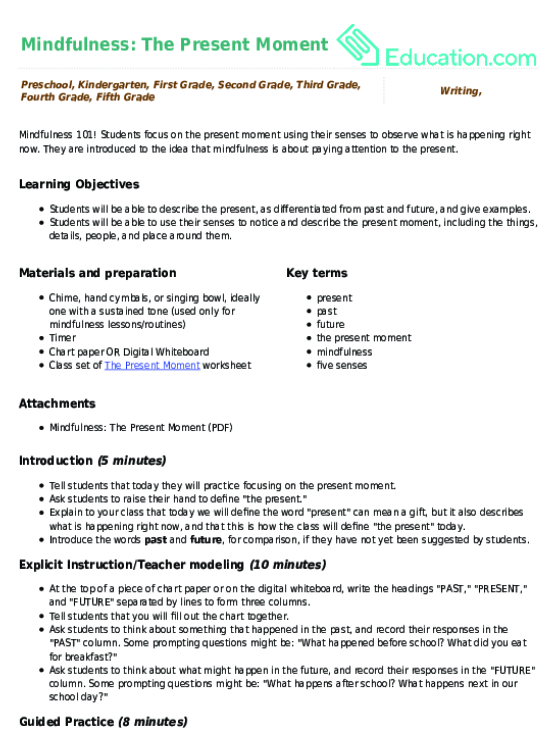 Have students share their ideas, and then introduce the word Stillness, if it has not been shared. Explain that today you will explore the relationship between mindful walking and stillness. Explain that we can learn a lot about mindful walking and stillness from animals. Ask students to share thoughts about why that might be true. To prompt, you can explain that animals usually move deliberately, with purpose, and pay attention to where they are walking. Ask students to share what animals they have seen walking. Explain that today they will get a chance to practise walking mindfully like animals. Explain that sometimes when an animal is still, it is because they want to blend in to their environment or camoflauge. Introduce the word Camoflauge. Ask students to share if they have seen an animal that is camoflauged. Optional: Use visual resources (pictures or video). Explain that you will introduce a few special ways of walking like different types of animals. Even though many animals have four legs, students will practise on just two legs. Explain that first you will demonstrate, and then the students will try it out. Explain that when they hear the chime, that is their cue to arrive in stillness and be camoflaged. When they hear a chime a second time they will be ready to listen to the teacher. Demonstrate walking like a deer — slowly and carefully. Demonstrate pausing in stillness, camoflauged, with the chime. 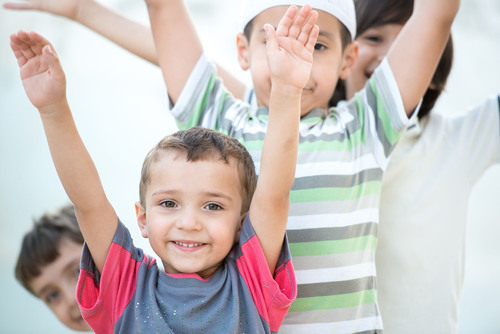 Ask students to stand up and find their own space in the room. Remind them that today they are moving slowly and mindfully, and that animals don't bump into one another. Prompt students to begin moving like a deer. Ring the chime to prompt stillness for 30 seconds (using the timer to keep track and making sure it is silent), asking students to be as still and camoflauged as possible. Ring the chime to cue attention back to you. Now demonstrate moving like a stalking cat. Demonsrate pausing in stillness, camoflauged, with the chime. Prompt students to begin moving like a stalking cat. Ring the chime to prompt stillness for 30 seconds (using the timer to keep track), asking students to be as still and camoflauged as possible. Ring the chime to cue attention back to you. Ask students to think of an animal that they would like to try. Call on one student at at time to share their animal, demonstrate how it walks, and show how it pauses in stillness/camoflauge. Ask the student to share why he/she chose that animal, and how they think it moves mindfully. For each animal, follow the same process: Walk mindfully like the animal demonstrated, ring the chime for 30 seconds of stillness/camoflauge, and then ring the chime to bring attention back to you. Repeat this process five to seven times, or as much as desired. 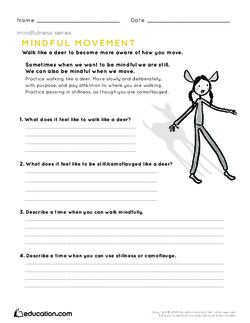 Preview the Mindful MovementWorksheet as a class. Have students create their own creature that could be camoflauged in the classroom. They can draw this animal on the back of their worksheet, and describe how it moves and how it camoflauges. Optional visual resources: Pictues of camoflauged animals, video link to animals walking or stalking. In partners, ask students to reflect on any or all of the following questions. "What did it feel like to walk differently than normal? Is there a time you might want to walk mindfully? Is there a time when you might use stillness or camoflauge? What did you like best about today's lesson?" Rotate around the room and listen to the conversations. Ask students to share what they talked about with their partners. Challenge students to think about times they can walk mindfully, and times they can use stillness for the rest of the day, week, and school year. 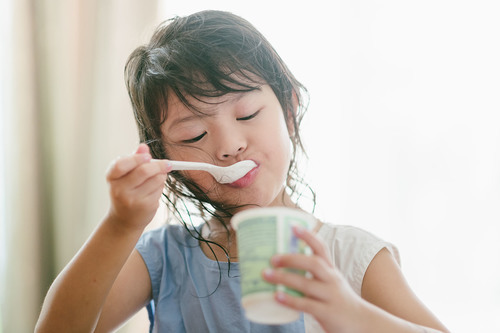 This worksheet helps students reflect on a mindful eating experience. Mindful eating is a great way to practise mindfulness infused with gratitude and appreciation for our food.